Smartphone retailer and network provider Orange has officially unveiled its first own branded tablet with the Orange Tahiti to land as a 7-inch Android offering. 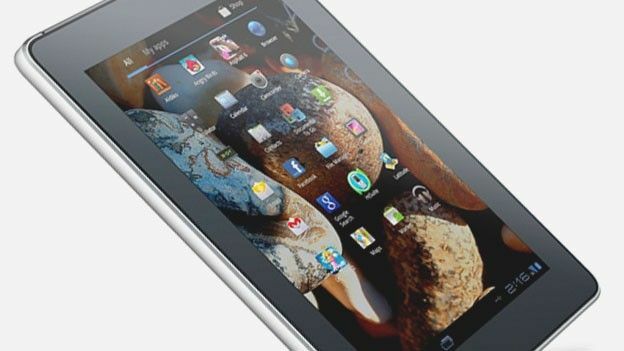 Whilst the term iPad challenger might not be banded around for the launch of the Orange Tahiti the latest 7-inch Android offering is set to open the tablet market up to a wider audience with the sleekly designed Tahiti to bump shoulders with the original Samsung Galaxy Tab and the flailing BlackBerry PlayBook. "We're pleased to be expanding our portfolio of own-brand devices into tablets for the first time,” said Paul Jevons, Director of Products and Devices at Orange's parent company Everything Everywhere. “The Tahiti is a stylish, lightweight device with a great quality screen, which we believe really does offer great value innovation and will help customers to get the most out of their multimedia content whilst on the go”. Sporting a 1.2GHz dual-core Qualcomm processor the Orange Tahiti is no slouch backing up its impressive CPU with a lightweight 390g form factor and a 5-megapixel rear-mounted camera. Touting the usual array of connectivity options from Bluetooth and Wi-Fi to 3G the Tahiti lines up at just 10.5mm thick with 512MB of RAM paired with 8GB of internal storage, a claimed 6 hour working battery life and Google's Android 3.2 Honeycomb mobile operating system. Available across the UK today the Orange Tahiti marks the company's first foray into the own branded tablet market following a number of Orange branded entry and mid level smartphones in the past. Pricing the Tahiti similar to the latest high-end smartphones consumers eager to snap up their own Orange branded tablet need part with only £69.99 upfront whilst signing on to a 24 month, £25 per month data plan that sees users given 1GB of anytime data, 1GB of quiet time data and unlimited Wi-Fi access each month. Are you tempted by the newly unveiled and now available Orange Tahiti or is the Apple iPad the only way to go when entering the tablet market? Let us know what you think via the comments box below.